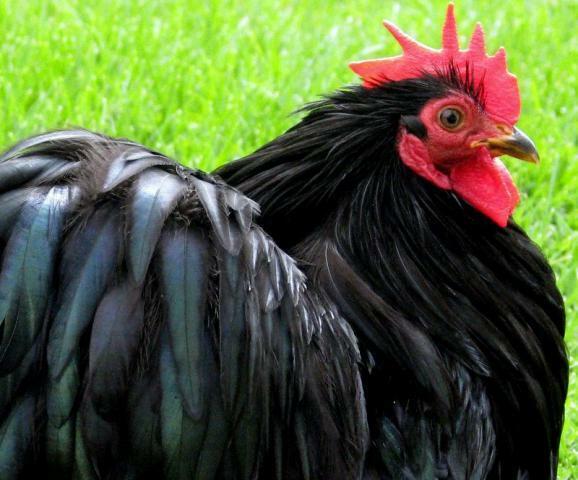 In August of 2009, I purchased my first trio of show quality Black, Bantam Cochins. They were bred by John Bashaw, of LaCrescent, MN. Mr. Bashaw has been breeding, showing, and judging poultry for over 50 years! Nothing like starting with the best! This is his first night in his new home with "Silk" and "Satin"
Both girls had been in breeding pens so were a bit bare headed. They're MUCH prettier now! that I needed more! So, I started doing a LOT of research. Spending endless hours on the web, learning about this magnificent breed and trying to decide what colors I would like to raise. Then, a friend sent me a link to a photo of a MILLE FLEUR colored cochin. That's it. I was a goner! I have spent the past week on the computer for endless hours every day and night. I've looked at hundreds of photos and chatted with numerous breeders. I've discovered BYC, and Eggbid and Feathersite. The "Mille Fleur Progress Update" in the forum is PRICELESS! knowledge, and most of all for MILLE FLEUR COCHINS!! !